Penobscot Bay Ringers was founded as a community handbell choir by Ella Saltonstall and Leigh Smith in June 2008. Penobscot Bay Ringers is a 501(c)(3) nonprofit organization under the IRS Code. We have obtained and annually maintain our license from the State of Maine Office of Professional and Occupational Regulation, as a charitable organization, permitting us to solicit, accept, and obtain contributions for charitable purposes. PBR’s financial records are available for inspection and review upon request. 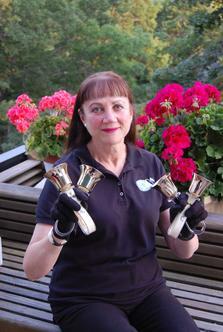 Debra has been ringing handbells for more than 45 years. Her music education started at the age of 6 when she began piano lessons, ultimately leading to a full-tuition scholarship on clarinet at both Texas Christian University and Southern Illinois University. Beginning in high school, Debra served as a church organist, founded / directed a handbell choir, and taught piano and organ lessons. Debra has focused on solo handbell ringing the past 10 years and has performed as a soloist at charitable concerts in Naples, FL, Dallas, TX, and Midcoast Maine. Debra graduated with a degree in political science and a juris doctor in law in 1980. She continues to practice law. She resides in Rockport with her husband and their wonderful yellow labradors, McKenzie and Kelsey. 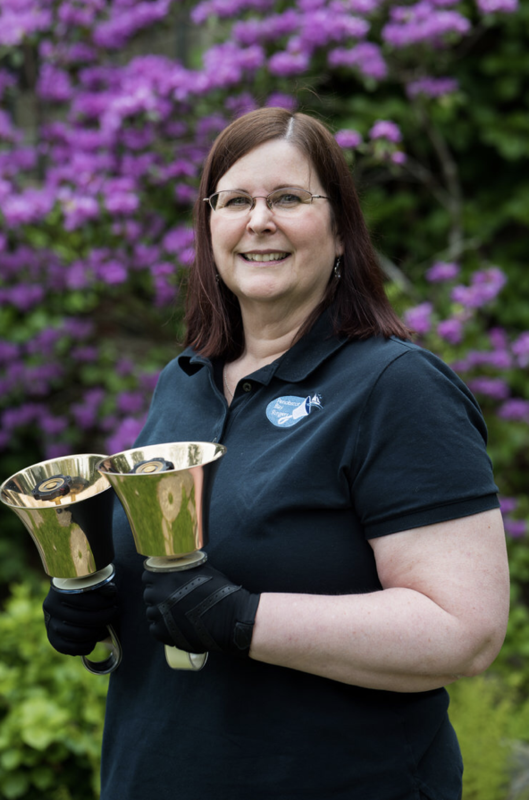 Mentored by an original Beacon Hill Handbell Ringer, Leigh Smith, 2008 PBR Co-Founder, has been ringing for 41 years. Playing live on Boston radio with the Lexington, Massachusetts 'Grace Chapel Handbell Choir', she founded three Massachusetts bellchoirs. In 2006, she established Camden's 'Ringing in the Season', which has brought in thousands of dollars for Maine charities. She's rung locally with 'Choral Bells', 'Upper Room Bell Ensemble', 'Bells of Aldersgate', and 'Timbrel Ringers', and also plays clarinet in CSBC's 'Discovery Band'. Leigh retired from nursing in 2008, after 42 years. She had worked as an RN in California plastic surgery, a Boston junior college, and Neuro/Neurosurgery, Kidney, Liver, and Stem-Cell Transplants at Lahey Hospital and Medical Center. Three dozen orchids fill her Camden home, shared with Ron, her husband of 51 years, and Yellow Lab 'Cinnamon-Stick'. They have two children, two grandsons, and volunteer together in several organizations. 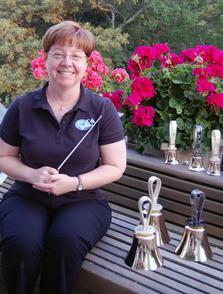 Amy began ringing handbells in 2006. She joined Penobscot Bay Ringers in 2008. She was board President from 2010 through 2014. To stay current in handbell education, Amy regularly attends seminars and workshops sponsored by Handbell Musicians of America. She serves on the biennial Maine Spring Ring steering committee. Amy earned a Bachelor's degree in marketing from Bryant College, Smithfield, RI, in 1988. She held marketing leadership positions in the advertising, hospitality, and banking fields for 25+ years. Currently, Amy is Member Services Director for the Penobscot Bay Regional Chamber of Commerce. She and husband Peter own and operate Mid-Coast Limo since 1997. She is a Camden, Maine native. Though their children have flown the coop, Amy still considers her role as mother of Erin and Ben to be her most important and rewarding work of all. The Rollins family lives in Lincolnville with their two cats, Bandit and Tessie. Bethany is currently writing her bio as she is the newest member of the Board! We thank Bethany for stepping up into this position as her opinion, pleasant outlook, and great ideas are extremely valued. With her mother directing the handbell choir at her childhood church, Emily has been ringing handbells since she was 11 years old. She continued to ring through college with the Mount Holyoke College Handbell Choir, in South Hadley, MA. Emily started ringing with the Penobscot Bay Ringers in 2017 and maintains the website and all social media platforms. Emily obtained a major in Psychology and a minor in Vocal Jazz Performance from MHC. She currently works as a data management and auditing consultant in the biotech arena. Originally from Massachusetts, Emily now lives in Rockland with her husband, Ian, where they are restoring their Victorian home to its former glory. If not working on the house, you may find Emily in her garden, boating on the Penobscot Bay, or running with their Chesapeake Bay Retriever, Brewster. Ruling the roost are their three Applehead Siamese cats, Emmie, Grady, and Nixie.